Biamp demonstrated its Crowd Mics system at ISE 2019. Biamp’s Crowd Mics system transforms smartphones and tablets into a personal microphone and interactive response system, creating a streamlined experience for event attendees and moderators alike. Designed for presentations, lectures, panel discussions, and other presenter/audience events, Crowd Mics is hosted on a small hardware appliance, the ATOM, that supports up to 1,000 event participants. ATOM connects directly to the room’s audio system via USB or balanced audio outputs, includes the option to present video via HDMI, and provides moderators full access to the event’s participation log, including questions asked and poll results. 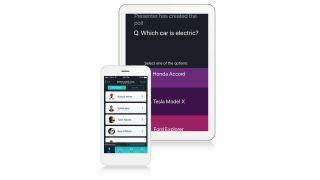 Audience members connect to ATOM using a free iOS or Android app installed on their phone or tablet. The app lets event participants use their smartphones as a personal wireless microphone and gives access to standard audience engagement tools like polls and messaging. The separate Crowd Mics moderator application allows a presenter or moderator to select who will speak next, create and publish polls, and select audience text comments to be pushed to the room’s AV presentation system. Crowd Mics can be managed through Biamp’s SageVue 2.0 browser-based monitoring and management platform. Biamp expects Crowd Mics to be available in the second quarter of 2019. The original Crowd Mics application was purchased by Biamp in 2018 from Crowd Mics founder Tim Holladay in Biamp’s first acquisition under president and CEO Rashid Skaf. Holladay is joining Biamp at ISE and will promote the launch of the product in the Biamp booth (stand 3-B120).